the nytpicker: Clark Hoyt Demands That Brook Barnes Apologize to Angelina Jolie. Seriously. Clark Hoyt Demands That Brook Barnes Apologize to Angelina Jolie. Seriously. In today's Public Editor column, Clark Hoyt undercuts a fundamental tenet of journalism by demanding that a reporter give up his source, or retract his story. It's a flagrant and unfair attack on reporter Brooks Barnes and the editors who believe in his reporting. The background: a page one story on November 21 contended that Angelina Jolie had asked magazines bidding for exclusive photos of her children to offer an "editorial plan" for coverage -- including an article that would not reflect negatively on her or her family. Barnes attributed that assertion to "two people with knowledge of the bidding who were granted anonymity because the talks were confidential." People Magazine won the war over the photos, and their resulting coverage was positive, in precisely the manner the actress's handlers had requested. Barnes noted that no mention was made of "Brangelina," a nickname that he said "irks the couple," referring to Jolie and her husband, Brad Pitt. When Angelina Jolie and Brad Pitt negotiated with People and other celebrity magazines this summer for photos of their newborn twins and an interview, the stars were seeking more than the estimated $14 million they received from the deal. They also wanted a hefty slice of journalistic input — a promise that the winning magazine’s coverage would be positive, not merely in that instance but into the future. Barnes's story makes no specific mention of the deal with People Magazine; it only addressed the fact that the publishes story made no mention of "Brangelina," and reported on the couple's charity work. After the story was published, People Magazine's editor, Larry Hackett, flatly denied a deal for positive coverage. And today, after interviewing all the principals involved, Hoyt contends that Barnes's story doesn't properly prove its assertions, including the notion that People had agreed to the couple's conditions. "While the article did not directly say that Jolie got what she wanted from People, the winning magazine," Hoyt acknolwedged, "it strongly implied it." Hoyt interviewed Hackett; Mary Green, the People Magazine reporter; Geyer Kosinski, Jolie's manager; Jon Liebman, Pitt's manager; and Jonathan Klein, the chief executive of Getty Images, which took the pictures. All insisted that no deal existed with People Magazine to control the content of its coverage. Hoyt also said he read the contract for the photo purchase. "It made no mention of positive coverage, an editorial plan, a road map for a layout or any other editorial conditions," Hoyt said. Hoyt did concede that the 18-page People spread "was certainly positive, even glowing." In the end, Hoyt's conclusion is as shocking as it is a violation of a basic journalistic principle. He sides with the assertions of People Magazine, and concludes that unless Barnes's sources go on the record to contradict those assertions, the Times needs to redact its original account. He takes this position even with the knowledge, from the Times's media and marketing editor Bruce Headlam, that Barnes has found a third anonymous source to back up the reporting in his original story. I think that unless one of his sources is willing to come forward — on the record — and state firsthand knowledge contradicting Hackett, Green, Liebman, Kosinski, Klein and the written contract, the paper needs to correct the impression it left of a deal it cannot prove. Headlam said he believes the Barnes story is solid. That leaves The Times relying on anonymous sources to dispute on-the-record sources, a questionable position over a story of less than world-shaking import. A former aide to Mr. Cuomo, who spoke anonymously because he was asked by another former Cuomo adviser not to speak publicly about the portrait, said the former governor always felt conflicted about being at the center of things. The silly reasoning behind anonymity in the Times could make its own series of Hoyt columns. But the fact is that reporters depend daily on the need for people to speak honestly about events behind the cloak of anonymity, usually to protect themselves and their livelihoods. It seems fair to assume that in the case of Barnes's reporting, his sources -- who he represents as having direct knowledge of the negotiations -- would lose their jobs if Barnes gave them up to Hoyt, or to the public. That may not be of "world-shaking import" to Hoyt, but it is to the sources and their families, who would rather not see their livelihood lost for the sake of Brooks Barnes's career. But the truth is that only one principle matters here: the right of a reporter to promise anonymity to a source, and the responsibility of that reporter to protect his source. The idea that a Public Editor -- a respected former Knight Ridder editor -- would demand that a Times reporter disclose his source as a means of proving his story's accuracy is a terrifying precedent. Headlam, Barnes's editor, must know the identity of Barnes's sources; that disclosure is a part of Times policy, and Hoyt knows that. Why isn't the Times's backing of Barnes enough for Hoyt? Is it because Angelina Jolie -- an Academy Award-winning actress strikes him as more believable? Is it because Hackett has so vociferously denied the story? Has Hoyt never heard of the subject of a story denying its truth, simply because it's clear it can't be proven? Remember, for Hackett to admit the accuracy of Barnes's story would likely lead to his own dismissal. The Times has a demonstrably excellent record for accuracy. Judith Miller and Jayson Blair notwithstanding, the paper rarely retracts its stories. Brooks Barnes is a talented reporter who came to the paper from the Wall Street Journal with years of experience. 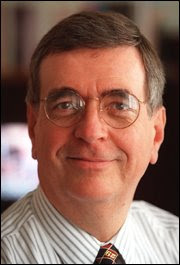 Bruce Headlam is a respected editor who has surpervised the paper's exhaustive coverage of the news media. No matter what the public assertions of those involved in the negotiations, there's no reason to believe that they're not denying the story for the sole purpose of protecting their interests -- which may or may not involve the truth. For Clark Hoyt to side with an actress, her handlers, and a celebrity tabloid -- and to demand that the Times serve up its source or retract its story -- is wrong. It's reason enough to replace Hoyt -- not to reward him, as the Times did this week, with a one-year extension of his contract.